Kris Richards: "A lot of people have a misconception that marriage is the culmination of a relationship." (RealSimple.com) -- For this constantly bickering couple, talking about divorce forced them to re-evaluate and revamp their differing communication styles. When Akilah and Kris became friends in the 10th grade, she was the extroverted captain of the cheerleading squad and the student-government vice president. He was a precocious student (he had skipped a grade) and a serious artist who preferred drawing to, well, people. Still, they clicked. "I liked that Kris was really laid-back," says Akilah, 33, "and he appreciated my big personality." RealSimple.com: What is your body language saying? She and Kris, 32, lost touch after graduation but reconnected through an old pal four years later. Their friendship picked up where it had left off and slowly evolved into something more. "After one phone call, in which we joked about the typical day of a married couple, I knew he would be my husband," Akilah recalls. Problems started shortly after their 2002 marriage. They bickered over everything, from Kris's habit of leaving his shoes in the front hallway to how often the home office should be cleaned. (The couple jointly own their own businesses.) A slight difference of opinion would leave them fuming for days. "We'd high-five each other if we could go three days without a fight," Akilah admits. The qualities the couple once prized in each other -- Akilah's verve and attitude, Kris's easygoing manner -- were now sources of irritation. When faced with a problem, Akilah preferred to lay everything out on the table, while Kris, who hates conflict, would try to drop the subject. "Now I realize avoiding the issue just made everything get worse," he says. All that pent-up frustration was bound to explode -- and it did, on one wintry evening in December 2009. Akilah and Kris had taken their two daughters to a Kwanzaa celebration. When their five year old, Marley, climbed onto the stage during a performance, Kris was appalled by her behavior and gave her a stern dressing down. Akilah thought he was overreacting and angrily told him so. Kris withdrew coldly. The pair drove home in sullen silence, put Marley and her younger sister, Sage, three, to bed, and once again began to fight. Akilah knew she had reached a tipping point in the marriage. Throughout her teens, she had watched her mother struggle in a troubled relationship. "I remember all the anger and raised voices," she says. "My mother was unhappy but stayed with her boyfriend for years. That was not what I wanted for myself." A few days later, Akilah told Kris she intended to call a divorce lawyer. He was shocked and saddened. But he didn't want to argue anymore, either. Numbly, he agreed. Soon after, the couple sat down to rehearse how they would break the news to their daughters. And Kris surprised Akilah. Calmly, he started asking her questions that warranted thoughtful answers, like "How can I speak honestly when you lash out at what I say?" Once Akilah realized her husband was genuinely trying to understand what had gone wrong between them, she says, "I was willing to stop saying 'I quit' and get into the thick of things with him." Akilah and Kris discussed what was upsetting about the other's communication style. Kris felt Akilah tended to cross-examine him. Akilah needed Kris to talk to her rather than retreat. To break the cycle, Kris proposed they set aside a period of time to think through an issue before hashing out a solution. And when Akilah felt herself acting like an imperious prosecutor, she would reach out and take Kris's hand. "That simple gesture reminded me of what matters -- our relationship -- not the details of some trivial incident," she says. Today the two still have their scuffles, "but we get through the conflicts better and faster," says Kris. During a recent trip to New York City, Akilah was irked when Kris scheduled a client appointment that took up some of the time they had planned to spend sightseeing. "A year ago, we would have gotten in a snit and gone our separate ways for the day," says Akilah. This time they talked it through and took advantage of the hours they could be together. "A lot of people have a misconception that marriage is the culmination of a relationship," says Kris. "Far from it. 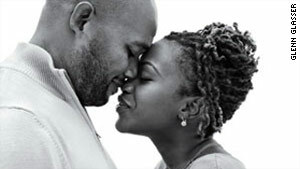 Marriage is a constant process of finding the best possible way to connect with another person--and that's what Akilah and I want from each other."